Slade is the main character in the gripping epic story Teknoman, also known as Space Knight Tekkaman Blade. He first appears in the series as a stranger that comes from a newly formed crater, which Star and Ringo find. The following paragraphs show him and his relations to the workers of the organization he joins. It is soon found that he can become the only thing that can stop the enemy forces in the story by using a special crystal that transforms him into an extremely powerful cyborg soilder. The suit he wears is virtually inpenetrable by Earth weapons. The only flaws in this is that the only thing that can hurt him is begin either overwhelmed by spidercrabs, the main enemy soilder unit, other Teknoman, which serve the enemy leader, Darkon, and going over a 30 minute timelimit, then he goes beserk and the darkness overcomes him.... making him more dangerous than helpful. It's because of this that he tries to make his battles short. Very introverted, he rarely speaks much. At first, his blatent mistrust of those around him nearly gets him killed on a few occasions. Mostly with Ringo. Until he begins to open up and creates a strong friendship with the other members of the small team of an independant organization that has nothing to do with the present world unified military, called the Space Knights. Tina, a communications officer with the space knights, bears an uncanny resemblence to his sister, Shara. It's because of this that Slade stops himself from killing her after his 30 minute timelimit expires. 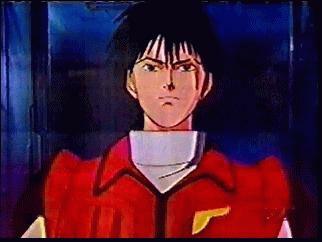 Ringo, pilot of the Space Knight transport ship the "Blue Earth" being the observant man that he is, constantly jokes around with him about his ability or his reluctance to admit his feelings toward Star later in the series. How people put up with this man, I have no clue. Star, being the optimist, tries to see the good in Slade while they at first meet. Time after time she seems to bring our reluectant hero out a few depressions with her "It'll turn out okay" attitude and like Tina brings him back at one time, but not while after his timelimit expiration, but convinces him to fight again after being verbally beaten by a Teknoman like power-suit's pilot, Balzac. Maggie, being the hopless romantic, openly admits her feelings for out hero, even though no one seems to take it seriously, not even her. Being a natural with computers, she is able to repair Slade's crystal and attach it to his teknobot, Pegas, therefore making him stronger as Teknoman, after it shatters near the beginning of the series. Mac, being a master mechanic, builds, maintains, and repairs vehicles the space knights use. Although looking definately Mexican, the Scotsman plays a small father figure to Slade, teaching him how to make a kite on their day off and telling him about the old days before the war. Finally, Commander Jamison, the leader of the space knights, convinces Slade to join him and Earth's battle against the enemy. Being a very cunning man, he is always finding ways to make things better for everyone that works for him, even breaking into the world defense net to allow Ringo and Star to free Slade from being imprisoned at the world army headquarters. The name "Slade" was used in the English dubbed TV version, though it was changed back to "Blade" for the DVD release. The above description came from Khryis, and was edited by yours truly (contact me).